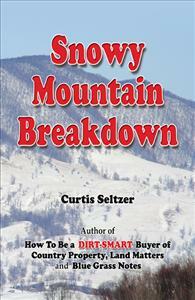 Snowy Mountain Breakdown collects Curtis Seltzer’s 50 syndicated “Country Real Estate” columns from 2011. They were distributed to about 1,800 media outlets, reporters, organizations, corporations and individuals. www.curtis-seltzer.com. Snowy Mountain Breakdown is a collection of 50 short, often humorous, essays about life, work and ideas on a cattle-and-timber farm in the Allegheny Mountains of Virginia. Highland County has a full-time population of 2,300, two lawyers, one blinking traffic light and no child left behind so far. These “Country Real Estate” columns were written in 2011 and distributed weekly to about 1,800 media outlets, organizations and individuals. Land Matters and Blue Grass Notes collected his earlier columns. www.curtis-seltzer.com.